Samsung Galaxy S10 is the most excellent phone with plenty of brand-new features. And one of the most incredible features of this phone is Wireless Powersharing. Enable and Turn on Wireless PowerShare on Galaxy S10 and Galaxy S10 Plus. Your Galaxy S10 has one of the most spectacular features of Wireless Powersharing. Your Galaxy S10 allows you device-to-device charging without using a charger. You can charge your Galaxy S10 and another device at the same time. Your Samsung Galaxy S10 has a larger battery, which gives you long battery life and faster app launching. The in-built machine learns your behavior so that it can automatically adopt to power saving modes and restricts unfrequently used apps to maintain the battery for a longer period of time. 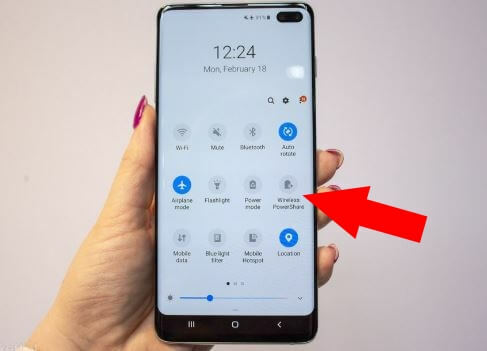 Step 1: Scroll down the Notification Panel on your S10. Step 2: Click on Wireless PowerShare icon to make it enable. Step 3: Set the center of S10 back-to-back with another device. Step 4: Once the device is connected, the screen will confirm the connectivity by displaying a message. Tap Ok on that message. Step 5: If you scroll down the notification panel again a message will be displayed that connected device is charging or green Wireless PowerShare icon will appear on the display bar or on your Always On Display Panel. – Most QI-compatible devices should work with Wireless PowerShare, but check out the full list of compatible devices below just in case. Note: To Use Powershare, Your mobile charged at least 30% charged. Hence By following these steps, you can charge another device on S10. And separate the devices when it is charged. Note: Through this feature, you can charge only the device which supports wireless charging. And the location of the charging coil may vary from device to device. You need to adjust the device until it connects with each other. 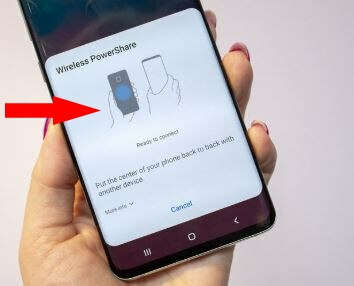 If your Galaxy S10 has a low battery, Wireless PowerShare will automatically switch off. 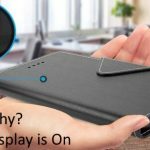 Wireless Power Share feature will not work properly due to accessories or phone covers used by you. So it is suggested that remove all accessories and cover while using this feature. And charging speed may vary from device to device. Enable and Disable AirPower on Galaxy S10 and S10 Plus.